Ofcom has opened a consultation upon the process that mobile customers have to go through to change providers. It says that it's important that customers can switch mobile providers easily "in order to take advantage of competition in the communications sector". Obviously Ofcom has noticed there is currently a problem with the way users have to jump through hoops to switch from one mobile provider to another. If you've ever switched mobile networks it probably wasn't a quick and pleasant process. The last time I switched, from EE, I had prepared a calendar on what day to phone up to obtain a PAC, what day to give notice, when to buy the new mobile contract and so on. Despite my plans I did various things too early and others too late and incurred extra contract overlapping costs. I was very annoyed to get charged an early termination fee despite taking the advice of an EE advisor and then was too late to call about some step in this process as EE's call centre customer services were closed one day "due to overwhelming demand for the iPhone 6". That was all sorted out in the end – and I got refunded – but it took a lot of calls and caused a lot of friction. Of course other networks can be just as bad in helping you transfer away smoothly. Ofcom has seen evidence that "a significant proportion of those who have switched mobile provider continue to experience process-related difficulties arising from switching costs, multiple processes, difficulties co-ordinating the switch and continuity of service." Option 1: Simplifying the process for obtaining a PAC. 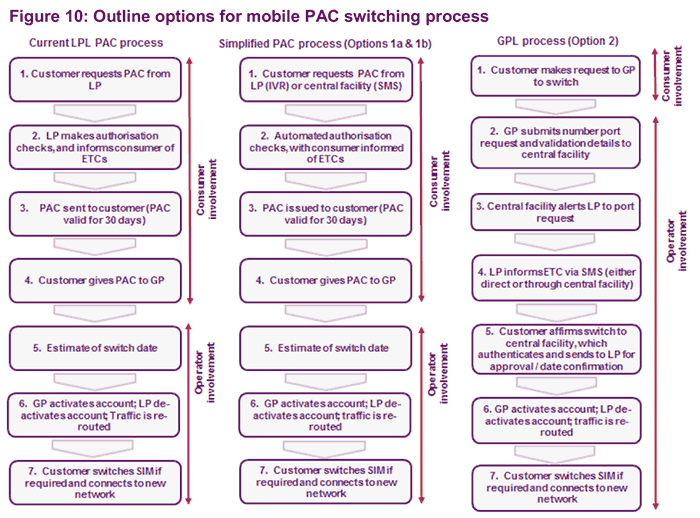 In this option Ofcom thinks that customers should be able to simply get a PAC without speaking to someone, possibly via an Interactive Voice Response (IVR) or SMS message. Alternatively a centralised porting system (CPS) should deal with all the PAC requests. Either of these will help reduce the opportunity for the leaving provider (LP) to slow down or make the process more difficult. Option 2: With this option the mobile switching would work just like broadband switching works now. This process would be gaining provider (GP) led. So to change mobile provider a customer simply calls the friendly, well staffed, sales department of a new provider, who then sorts out all the coordination and termination of old services/contracts for you. Key: LPL = leaving provider led, GPL = gaining provider led. SIM, PAC and SMS you already know. The Ofcom consultation is open for mobile operators and other parties to get involved with until 6th October. A decision will be made on what actions to take in Spring next year. Action is due to worries about Chinese espionage via critical networking equipment. Staggered rollout, 6 then 10, follows a “demand led” strategy. Aims to be UK’s first 5G provider. To make option 2 safe, all that needs to happen is that when the LP is notified that the GP wants to take the contract, put in a 5-10 working day wait period. Ssend a letter to the customer asking them to contact the LP if the switch was made in error and upon no contact from customer to continue with the switch. Personally, I don't give a hoot, not least because I don't care if I keep my existing nunber or not. In fact, one reason I've changed in the past was pecisely to change number. So, when I wanted out, I just cancelled, and went elsewhere. Besides, these days, PAYG suits me best, which is what I currently have. If I did use contract phones, though, two immediate thoughts cross my mind, and rainman already mentioned one, that being ‘slamming’ … and IIRC, it wasn't just phones subject to this, but utility suppliers too. So whatever OfCom comes up with, if it removes LP contact, it needs to ENSURE it absolutely requires genuine, legitimate and explicit customer initiation. I know OfCom can fine heavily (10% of turnover, IIRC), but's punishing the offender years down the track, and doesn't stop the consumer being put through the meat grinder in the meantime. I'd want to see the GP simply not able to I initiate transfer without some information they can ONLY get from me. Secondly, if the consumer can go to the GP and initiate transfer without talking to the LP at all, they may lose out by not giving retentions the opportunity to …. ummm …. ‘negotiate’ you staying. In short, I'd like to see OfCom put power in OUR hands to protect us from abuse of process, not babysit us, and try to take power away from us. There were suggestions from Cameron a while back about auto-switching utilities to the best (I.e. cheapest) deal. What that totally misses is that the best deal isn't necessarily the cheapest. I KNOW my current utility deal isn't the cheapest, but the cheapest doesn't have the conditions I want. I'm more than willing to pay for that. So provide backstop protection against abuse, but don't try to nanny us. Agreed entirely. I had a utilities company do that to me some time ago and it was a complete ball ache to sort out. I'm all for making things simple but I don't agree that not requiring people to talk to their current provider is a good thing. Far from it. If the system is open to abuse then it'll be abused and whilst Ofcom can indeed fine a company for doing so, it's the end user that gets mucked about with so it should be the end user that has the final say in a number porting. I buy the phone i want unlocked then i get the sim deal i want. If not PAYG then rolling monthly or at most a 12 month contract which i currently have with 3, 2GB data, 200 mins, unlimited texts for £11, thats more than enough for my needs. If after a year i think its crap then i cancel. My second phone has a 3 PAYG sim, 1p per data, 2p text, 3p a minute call, if its crap then once the money is used up i ditch the sim. I am not bothered about changing numbers as all contacts remain on the phone, you just need to text the new number.